Almost a month ago I wrote about Smirnoff's latest project, the Smirnoff Nightlife Exchange Project. Today saw the first taste of what the project with the public unveiling of the Nightlife Crate by artist Shane O’Driscoll. Shane was in charge of designing the crate that will carry an Irish night out to whoever our sister country turns out to be. Shane was on hand at Stephen's Green today with models Karen Fitzpatrick and Sarah Mc Govern. As yet the contents of the box are still to be decided, and that's where the public comes in. Your ideas of what the vital ingredients of our nightlife can be submitted through the Smirnoff Ireland Facebook Page. Here you can also find out more information on what will be happening with the overall project. The ingredients will then be revealed on October 22nd. After that all that's left will be to enjoy the November 27th party from whichever country we're sistered with. Overall the goal of the project is to show Smirnoff's belief in doing things differently. Smirnoff say, "that when you overturn convention or simply change one of the ingredients of a night out, you can create something special, something extraordinary – a night you look back on and are proud to say, I was there". Shane O’Driscoll was born in Cork and studied Visual Communications at Cork Institute of Technology. 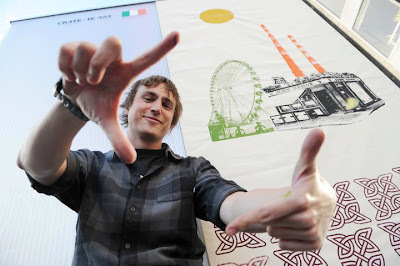 Shane is a member of Cork Printmakers and is also a director of “For the Love Of”, a series of Art & Design exhibitions that bring both emerging and established Irish Creative talents together in an accessible and contemporary environment. He has recently featured his work at various music festivals in Ireland. Shane has been with Gallery Number One for the last two years and his reputation as one of Ireland’s brightest young screen printers and creatives has gone from strength to strength. The Gibson Hotel, owned by Dublin entrepreneur Harry Crosby, recently purchased a number of his works for the hotel’s common areas. Shane will undertake his first major solo show in Gallery Number One this coming November.